Anatidish? What language do you think the anatidae would speak natively? As for the joke itself… look. If it’s good enough for a Star Trek movie, it’s good enough for me. That is awesomely geeky. I salute you! 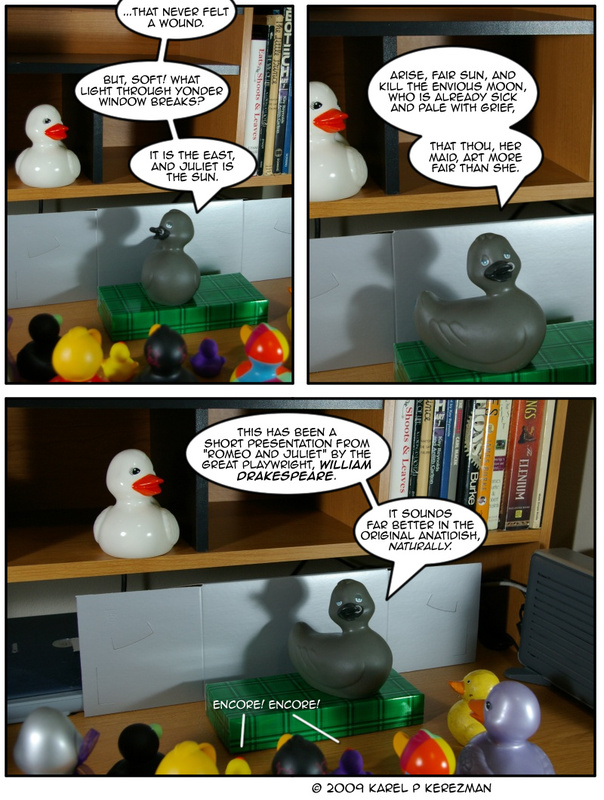 For a moment I wondered what that white duck was doing there on the shelf… But then I realized, “Oh, that one’s probably being Juliet.” The way Poe (I think) is looking in that direction in the first panel… that’s where I got that from. I’m probably reading into this too much. I thought about moving down the soliloquy a bit to the part where Juliet makes some sort of noise to clear that up, but the later bits of that scene aren’t as recognizable to non-Shakespeare… I mean, non-Drakespeare fans. In other words: Yep, you’re right.